Two weeks ago I wrote a blog post about What Lead Information you should keep track of. In that post I broke down the minimum data points that you would benefit from keeping track of over the course of a leads life. What I didn’t go over is how to keep track of your mailing campaigns. When I first started out I found that keeping track of mailing campaigns can quickly get out of control. I’ll be the first to admit that my memory is terrible…I was never good at taking tests. Once I had more then 3 campaigns running at a time I completely lost track of what needed to go out and when. Do you know what happens when things get complicated and confusing? You Stop! Multiple Campaigns Can Get CRAZY!! To try and make this as simple as possible I would only send my mailings out on the 1st of the month. That would put me in the ballpark of my 30 day spans between each mailing. That is pretty straight forward as long as you keep your mailings to the 1st of every month. However there are a ton of monkey wrenches that will complicate the simplicity really easily. Adding New Campaigns Each month. Let’s say we add a new probate campaign each month to correspond with the lists I’m getting from the courthouse. I am only going to lay this out over a one year period but it will give you a great idea of how this EXPLODES quickly! January 1st = Piece of Cake! April 1st = HOLY CRAP! June 1st = Where is that Foreclosure List? July 1st = 30 days has September, April, June and November…all the rest have 31…. October 1st = Does this ever get easier??? December 1st = Do I send out mail over the holidays?? That craziness only came by adding one new campaign per month. Just imagine if we were adding a new Absentee, Foreclosure and driving for dollar campaign each month as well? They all have different number of touches and intervals too. My head is spinning just thinking about it. Not to mention That is a CRAP LOAD of letters to put out if you are doing them yourself. What I’m leaving out of this discussion is keeping track of your budget within this chaos. I only had a $500 budget each month (~1000 letters) so I had to plan accordingly. Get my custom Excel Direct Mail Tracker for FREE! You then have to remove these leads from the lists they were on so you don’t mail them again as part of your currently running campaigns. Nothing pisses someone off more then getting mailing from you after they called up and told you to “take them off the list.” It’s even more fun when they cursed at you for sending the first letter. Makes you want to start screening your calls! Keeping track of responses and returned mail sounds easy. It’s just time consuming if you aren’t organized and don’t have a good system for keeping track of your leads. Working with multiple excel files (like I started out doing), made it hard to find someone. Well, it wasn’t really hard but it took longer then you’d think. I had a separate Excel file for each lead list so a quick “Find” for a name had to be done on each excel file. It’s good for keeping organized, but bad when you get a call from someone and all you know is their name. It’s not like they can tell you they were from your January Probate list right? You will find that sellers will hold onto your letters for months before calling. Besides merging all my excel files into one, I never could come up with a good system for this. Actually I did come up with a better solution..SI Lead Manager. Though that took me 4 years to develop. I really wanted to take my experiences with Direct Mail Marketing and Building a Lead Manager software to put something together to help you all out. This turned out pretty good think! I took the logic from my SI Lead Manager software and converted it to an excel “program”. It is just the basics of the Direct Mail Campaign Tracking piece, but it really translated well. I really wish I had this when I first started out! 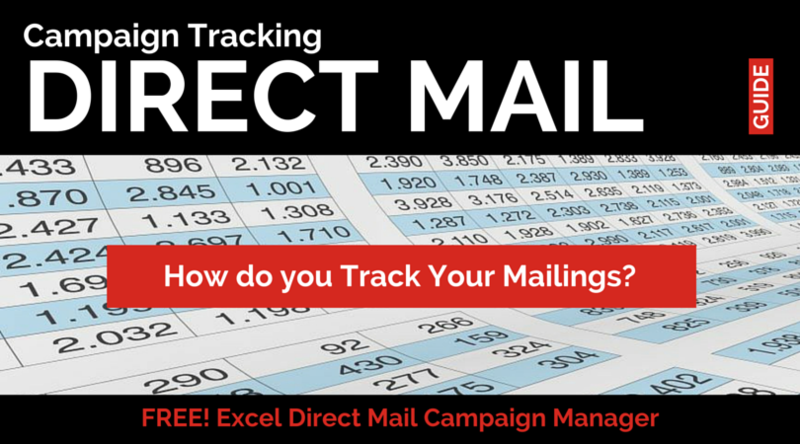 Download my Free Excel Direct Mail Campaign Tracker. A great way to start organizing your mailing campaigns so you never miss a mailing. How do you Organize Your Campaigns? I’d love to hear how you keep track of your campaigns. Is it in an excel file like I am giving away above? Or are you using a third party application like Podio? Thanks for the campaign spreadsheet. Your welcome James! If you find it useful would you mind sharing my post? Heard you on BP and really liked your approach .I am looking forward to trying your software which sounds like exactly what I need. Hey Michael! Thanks for stopping by my blog and I appreciate that kind words. Let me know if I can be of any help. Thanks so much for share both excel sheet, this is very helpful for new campaign creation process, great article… keep up.. Thanks for these tips. I am getting an error when I enable macros on the Campaign tracker spreadsheet. It says ‘Could not load an object because it is not available on this machine. ‘ I am running Office 2013 on a Windows 10 HP laptop. Any ideas? …and let me know how it goes. I have tried a couple time to get the excel template (and also signed up for REIFlow notfication), but have yet to receive any reply emails. Can get the file & update directly from you? What is the status of your SI Lead Manager? It sounds very interesting but the sale page for it shows that it not currently available for purchase. Hi Chris, SI Lead Manager was the old desktop software I was developing a few years ago. I stopped developing it because there was a lack of interest in a desktop application. Most people want web access to things and the ability to have partners/employees from anywhere access the app as well. I’ve moved onto Podio and developing REIFLOW for Podio. Makes sense. I will have to look into Podio. Don’t know how much traffic you get to these old pages but as a suggestion (I found it from a Google search for lead management software), perhaps redirect the old sale pages to a page that explains the change and outlining how REIFLOW provides the same and improved functionality as SI Lead Manager.